For much of my painting work now, I use reference photographs for a number of reasons. For my cityscapes, I can record detail and colour information that I don’t have time to capture when on a short holiday in an exotic location. When you only have 4 days in venice, you don’t really have the luxury of making paintings for hours on end! In my burlesque paintings, photographs can freeze a moment in time, an expression, or a pose that would be nigh impossible to hold for any length of time. Photographs can allow a painting to be worked on in the privacy of my studio with no intereuptions or interations with anyone else, and in this way, they are extremely useful. The other side of the coin, is that photographs only offer one perspective of the subject. You cannot walk around a photo in 3D or change the lighting or viewpoint for a different effect. The colours have also been limited and I find that after a while with only working from photographic reference, that my work begins to lack life and becomes too tight. So, I love to draw a living, breathing person whenever I can. Hiring professional models can be prohibitively expensive, but if that expense can be shared amongst a group of artists, then this problem is solved. 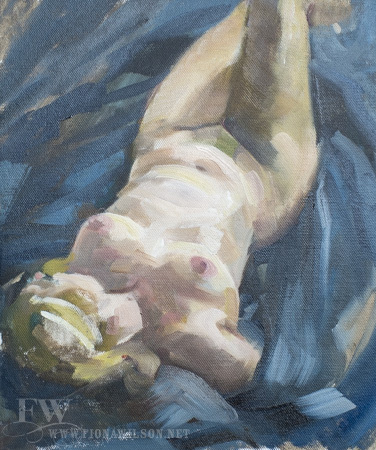 I am extremely lucky to know of at least 3 artist led groups at the WASPS studios that run life drawing sessions, and I try to catch at least one once a week. The first painting shown here was an attempt of not just drawing a figure from life, but painting one. I had the opportunity of sharing the model with a couple of other artists, and room to choose an interesting viewpoint. This painting was done over two sittings, one of 2 hours and the second, 40 minutes, a week later, when the underpaiting was nice and dry. The light was from a window so we had to work quickly, as at this time of year in Scotland, light is a rare thing indeed. This next painting is twice as big as the first at 30 x 40cm and was done over one sitting of 2 hours. It was a real challenge to try and not saturate the canvas with paint too quickly, so that layers were allowed to be built up. I am trying to use more variation in brush sizes and brush strokes to make up the image, and though I have a lot of practice to do, this painting has some of the life and vitality I strive to achieve in all my work. 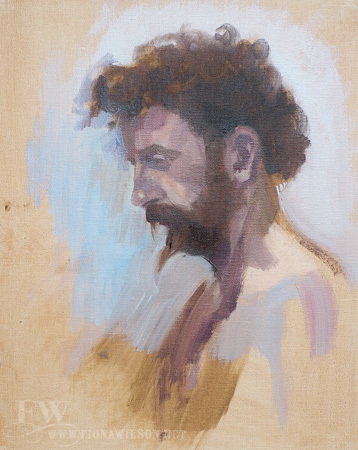 This last painting is a small head study (30 x 24cm) of our model Des. He was seated in an interesting pose, but I just had to capture a portrait of him with his wonderful wild red hair against the cool blue-white of the studio walls. This painting was done in a single 1.5 hour sitting with breaks. I had a moment when I thought I had messed up the nose, but I managed to retrieve thanks to Des sitting for 10 more minutes. I think he saw the panic in my face when time was called! Painting from life is the purest form of painting for me. You have a time limit which concentrates the mind and you are working with a living, breathing person that shifts slightly over time. Sometimes the painting just doesn’t work and becomes a learning sketch for the pile, but when a painting does some together and a great image emerges from the strokes of oil paint, like in these three examples, I am overjoyed. One hour may seem a short time to produce a painting, but in the moment, when I am struggling, not breathing, frowning and stressed with the task in hand, that hour can feel like an eternity.